Thrilling views of the world's most thrilling moments. When it comes to capturing sports or wildlife where the action is fast and the conditions are rarely favorable, lens speed can mean the difference between a great shot and a miss. At f/2.8, the AF-S NIKKOR 400mm f/2.8E FL ED VR gathers maximum light and renders beautiful bokeh. Nikon VR enhances that speed with up to 4 stops* of blur-free handheld shooting, including a new mode specifically for shooting Sports and Action, while a specialized electromagnetic diaphragm mechanism achieves remarkably consistent exposures when shooting at high frame rates. You might not be able to predict the spontaneous, but you certainly can prepare for it. Thanks to lightweight fluorite lens elements and a magnesium alloy die-cast lens barrel, the AF-S NIKKOR 400mm f/2.8E FL ED VR is nearly 2 lbs. 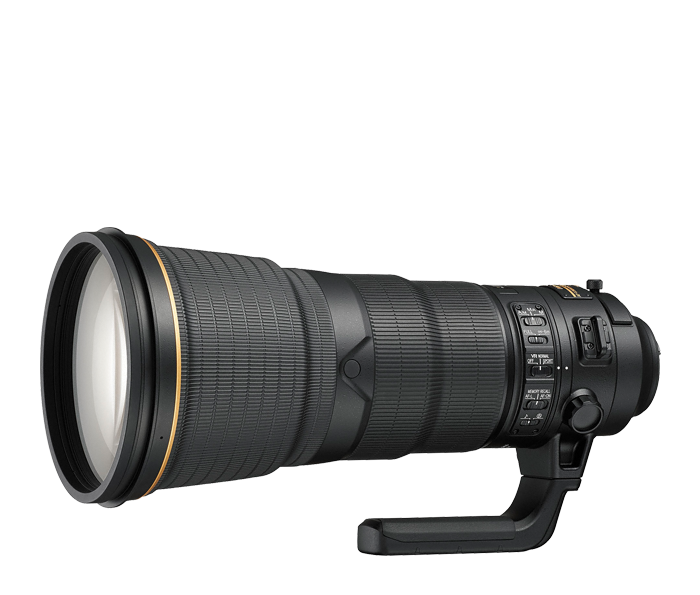 lighter than its predecessor, AF-S NIKKOR 400mm f/2.8G ED VR. Anyone who has spent time in the field with a large super-telephoto lens knows every pound counts. And since wildlife and action often mean harsh conditions, it features professional grade dust- and moisture-resistant sealing and a fluorine coated meniscus protective glass element at the lens front. Wherever your assignments or passion take you, the AF-S NIKKOR 400mm f/2.8E FL ED VR is ready. The AF-S NIKKOR 400mm f/2.8E FL ED VR is an advanced lens designed to draw peak potential from high-resolution Nikon D-SLRs. The lens' ultra-fast, ultra-quiet Silent Wave Motor (SWM) provides outstanding autofocus performance with seamless manual override (just spin the lens barrel). Two fluorite lens elements (FL) provide superior optical characteristics while minimizing overall weight, while two Extra-Low Dispersion (ED) glass elements nearly eliminate chromatic aberration, even at f/2.8.